Above, in the featured image, you can see what I believe is an accurate set of data about teams with cap advantage currently on their books. 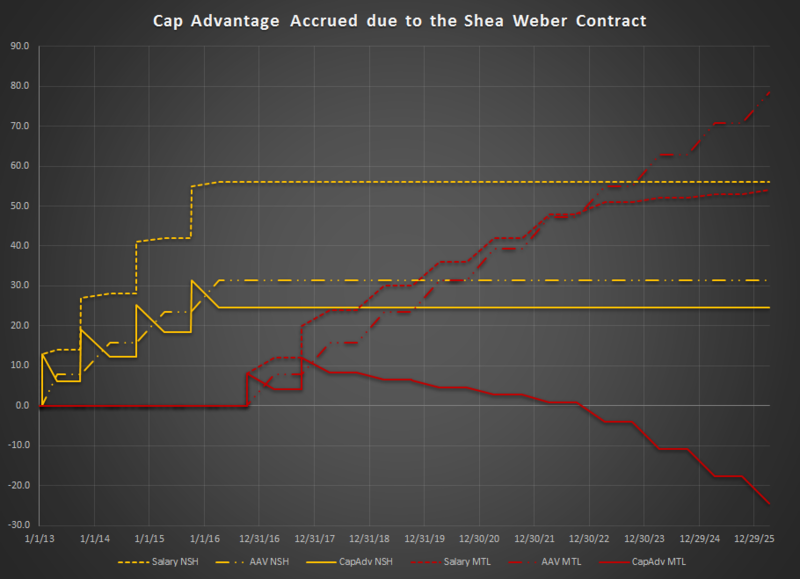 All of the points represent the level of cap advantage currently accrued by the off season of any given year. For example, the Chicago Blackhawks have $31.6m in cap advantage on their books at the time of the 2016 off season. This number will be true until the first day of the season (Oct. 12), when the AAV and salary numbers stick ticking up for the 2016-17 season. I have tried graphing the correct day-to-day changes of the contracts, but it just comes out overly complicated. It’s only really important when either trades or contract terminations occur mid-season; that makes up only about 25% of events that affect cap advantage accrual to date. You can find an interactive version of this chart here. If there is a problem (or praise) you’d like to share with me about this different service I am trying out, please contact me at @Chris_Beardy on Twitter, by comment below, or even on Reddit at /u/ChocolateAlmondFudge.